V.A. 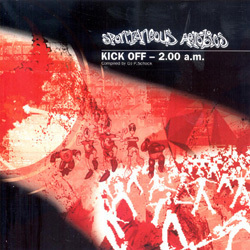 - Kick Off – 2.00 a.m. This is the first release in the "Full Contact" series by Spontaneous Aerobics. A colourfull collection of promising new upcoming artists and their definition of psychedelic night trance... Starting up with a track by russian artist "Transdriver" called "the Nutcracker" which is a rework of the "Nutcrackersuite" from Tschaikovsky. Next is a massive blaster by the "Naked Tourists" from Berlin called "Have more Fun" and we promise you will!! !Storming "M.I.D.A." brings us the next track with beatuiful harmonies and smooth guitars. "Keltik" from Groningen/ Netherlands is back again on the scene after he released his debut album `Liquid` on Psygrun Records in the late ninetys. Here he present his new track "Spirits". "High K.O." is a newcomer from Berlin and his track "Flipping Loonies" is a growling nightstomper. Next track is brought to you by "Naked Tourist" again who present us a stunning remix of their big hit "Zombifiziert" (SPAREP01). "TUL" from Israel celebrates the "Strings of Mordor" an outstanding Acidkiller. Followed by "Intergalactic´s - Deep Space Trance", which was featured on their debut album "Outer Galaxy" (BIOCD03). "Evil Drug Lords" another act from Israel showcases the more rock influenced side of psychedelic trance with his track "General Mish Mash". The end is brought to you by "DJ Turn & Bad Boy" with a special freestyle track called "Crosscut". A special track for special people.